This banana pudding is an old-fashioned dessert made with layers of vanilla wafers and bananas. The meringue topping is a classic finishing touch that will take you back to your childhood. 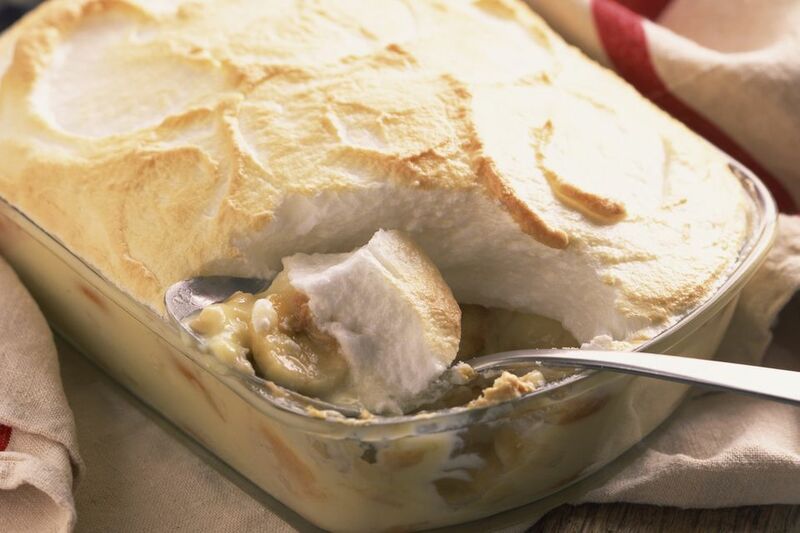 Make this delicious banana pudding and be prepared for rave reviews! Butter a shallow, 1 1/2-quart to 2-quart baking dish. Slowly add the milk to the sugar and flour mixture while stirring constantly. Set the pan over simmering water and cook until mixture begins to thicken, stirring constantly. Beat the egg yolks in a small bowl and then briskly stir a small amount—about 1/2 to 3/4 cup—of the hot mixture into them. Add the egg yolk mixture back into the hot mixture in top of double boiler and stir in butter and vanilla. Continue to cook until the mixture thickens again. Arrange a layer of vanilla wafers in the prepared baking dish. Add half of the sliced bananas. Pour half of the pudding mixture over the banana layer. Repeat the layers, ending with remaining pudding. In a mixing bowl beat egg whites until foamy; gradually beat in the remaining 1/4 cup of g ranulated sugar and the cream of tartar. Beat until stiff peaks form. Spread the meringue over the hot pudding. Bake in the preheated oven until the meringue is browned. Remove from oven.